"May you live in interesting times," an expression (a curse) that may be traced back to post-World War II England, but is apt today, when times have become all too interesting – chaotic and troubling. We must be reminded of the July 7, 2005 bombings of a bus and three tube trains that killed 52. More recently, May 2013, when a Muslim beheaded a soldier on the streets of London; and September, 2014, when a Muslim sodomized a dog and stabbed two women, beheading one of them; and October, 2014, when Scotland Yard captured four Muslims who admitted their mission to terrorize and decapitate ordinary people on city streets, and another four who were plotting to kill police officers or soldiers on London streets – a total of 218 arrests in the past 12 months alone. Britain identified a "complex web" of 60 Muslim Brotherhood organizations now operating from London, Istanbul, and Doha, Qatar. In Turkey, in August, Islamists shelled, beheaded, crucified and shot 700 members of the Shaitat tribe because they dared to rise up in their own defense. Over the past week, a recent convert to Islam ran down two Canadian soldiers in a Quebec province, and was shot while preparing to stab a woman police officer. A Canadian soldier was shot and killed by another convert at the National War Memorial in Ottawa; the suspect was killed. A Muslim terrorist ran his car into a crowd in a Jerusalem railroad station, wounding six adults and killing a 3-month-old baby. This was followed by rock-throwing session on a kindergarten and PA leader Mahmoud Abbas's praise of the killer's heroics. Two hospital guards at a Philippines hospital were murdered by a Muslim group. A suicide bomber killed another person in Libya, and six young people were executed and then hung, by ISIS, in Iraq. America surely needs repeated reminding of 9/11, for which Islamist apologists persistently dismiss with a flick of the wrist. Major Hassan's Allahu Akbar was cast aside with a flimsy "workplace violence" designation, and the stabbing and beheading of an employee at a meat-packing plant in Oklahoma was lost in the media amid all the other excitement of the times, including crimes called "scandals." But earlier today, a hatchet-wielding, self-inspired terrorist purposely targeted four New York police officers, perhaps in keeping with the new Islamic directive discovered by Scotland Yard. In fact, the Jihad Report shows Islamic terrorists are responsible for 78 deadly attacks during the week of October 11–17, 15 Allah Akbars, 630 dead and 828 critically wounded, bringing the total terror attacks since 9/11 to 24,184 – a number that changes with increasing rapidity. Walid Shoebat cautions in Why I left Jihad that Muslims have come here for one reason only – to physically act out their hatred for Jews and Christians, until their "enemy is obliterated." Muslims are attending universities only to infiltrate the student body and train and indoctrinate new jihadists. The extremists win over the moderates with campus events that incite the naïve Americans who have already been taught to accept multiculturalism, moral relativism, and contempt for the West. 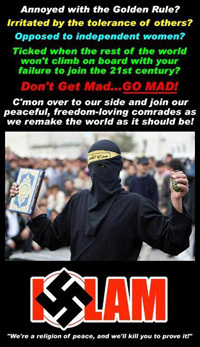 Spoon-fed Islam as an alternative culture by leftist professors, the students are motivated to collect huge sums of money and support the branches of the Muslim Brotherhood whose missions are to kill Jews, take over Israel, and conquer Western civilization. Crimes are on the rise in the US, such as the recent stabbing and beheading of an employee at a food distribution center in Oklahoma by an ex-convict, converted to Islam while in prison. When the crimes are reported, they are unconnected to any common denominator, yet there have been kidnappings, assassinations, and arson or firebomb attacks that are attributed to the homegrown Islamic terrorists, Muslims of America (MOA)/Jamaat ul-Fuqra, (aka Soldiers of Allah). Their connection is terrorist communes that are fully established and operational in rural America, Canada, and the Caribbean. Beginning in 1979, there were attacks on eastern houses of worship – Hare Krishna temples, Iranian (Shi'ite) mosque, an Islamic Cultural Center, an Indian-owned hotel, an Ahmadiyya Center, the Integral Yoga Society and two Vendanta Societies, a Laotian temple, and more. Physicians of Hindu and East Indian origin have been kidnapped and killed, as were mosque leaders. Tom Gallagher, of the Bureau of Alcohol, Tobacco and Firearms, describes the MOA, specifically, as a "violent, black Muslim extremist sect that acts out jihads against perceived enemies." The group provides firing ranges and paramilitary and guerilla-warfare training to spread Islam and destroy America through violence. Trained in camps in America, they are sometimes sent to Pakistan to become a new generation of jihadists. Their activities in Colorado (1989) have included fire breakouts at a power station. Law enforcement officials also discovered a large, well equipped arsenal, documents and photos of the Jewish Community Center and Hare Krishna Temple in Denver; and an illegal collection of checks. Four of five MOAs were arrested. An MOA arsenal was discovered in 1992, with plans for targets in Denver, Tucson, and Los Angeles. Five MOAs were arrested in New York in the 1990s for conspiracy to bomb a Hindu temple and Indian theater in Toronto, with an expected death count in the thousands. The FBI and local police discovered a cache of weapons to be used across the Canadian border. The NYC Dept. of Investigation uncovered an Islamic compound a year before the World Trade Center attack (arresting some for mixing explosives) and one year later, learned that this had been a training compound for 9/11. Eight men were arrested from another group with a plot to bomb the UN, FBI headquarters, and the Holland and Lincoln tunnels. A gang of ten who were arrested in three New York boroughs for selling illegal weapons was also linked to MOA. Other camps in the network were discovered in South Carolina, Pennsylvania, Virginia, California (see map at left), all controlled by the group's founder, a Pakistani Sufi mystic, Sheikh Syen Mubarik Ali Gilani. Although general reports claim more than 3000 members – many ex-convicts who had been convicted of violent crimes, the cleric and known international terrorist asserts to have as many as 15,000 followers, 35 "villages" in 22 states, ranging from 33 acres in South Carolina to 300 acres in California. En route to interview Gilani about his follower, shoe-bomber Richard Reid, journalist Daniel Pearl was kidnapped and beheaded because Gilani thought he (Pearl) was a secret service agent. Although Gilani's original purpose was to recruit mujahedeen to fight the Soviets, Gilani's ideology is the purification of Islam through violence – meaning, the obliteration of all infidels. And, recruiting American citizens makes it is more difficult to stop their activities. Not only are they protected as citizens by state laws, the US Constitution, and our climate of political correctness, but they formed a legal church, hence a tax-exempt organization. As such, they can conduct banking transactions, launder money; purchase land, buildings, lodging and safehouses, communication equipment, weapons, lethal substances/explosives, all without having to pay taxes or report expenditures or income. The U.S. State Department has known of these training camps since 1993. 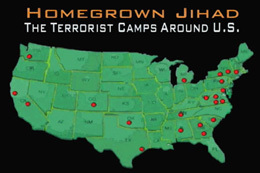 FBI Director Robert Mueller admits their existence; special FBI agent Jody Weis declared the homegrown terrorists to be more dangerous than any known group; and Ryan Mauro, national security analyst and political analyst, exposed the camps in the Counter Jihad Report. Sean Hannity (Fox News) reported on the status of these camps in 2009. Law enforcement officials believe Gilani hides terrorists (as the "Beltway Snipers" were probably hidden during their 23-day shooting spree in Washington D.C.). Christian Action Network (CAN) urges the U.S. to designate Muslims of America a "Foreign Terrorist Organization" (FTO). Sheikh Gilani operates from Lahore, Pakistan, and that connection would make illegal any support to his group, and restrict their funding and expansion. CAN also asks that we contact our political leaders and demand that Muslims of America be placed on the State Department's Foreign Terrorist Organization watch list and demand that each State and Congress outlaw any Islamic communities, organizations and mosques that preach Jihad against America. There exists a real and present danger to the survival of our country and our civilization, and a few phone calls might work to protect us. After all, daily life is interesting enough under the best of circumstances.